Rain's Garden: Halloween On My Mind!! 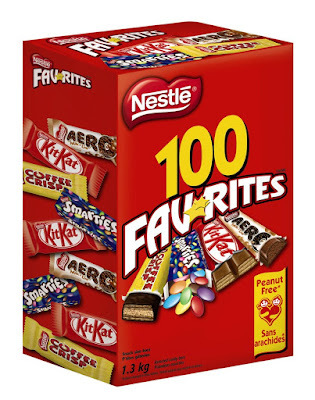 Halloween is my favourite holiday! I just love the spookiness, the weather and the fun I make for us each year. It has special meaning for me in so many ways! 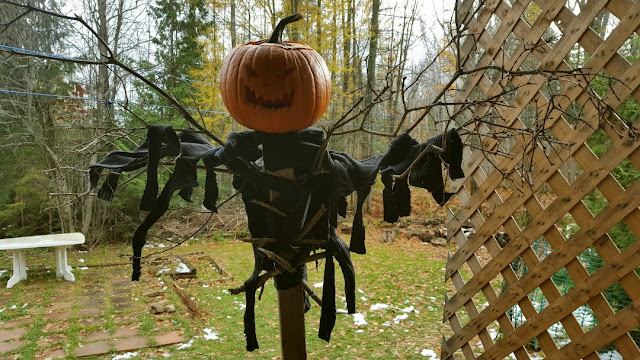 Wanda from Got a Minute Or Two posted some lovely fall decorations so it got me thinking about what I'll be doing this year! I've already got a bunch of new ideas. These were four of my five pumpkins from last year. My favourite was the Frankenstein. I didn't think I could pull it off, but it turned out really well! I don't think I'll do so many carvings this year...but I'm hoping they'll be my own homegrown pumpkins! 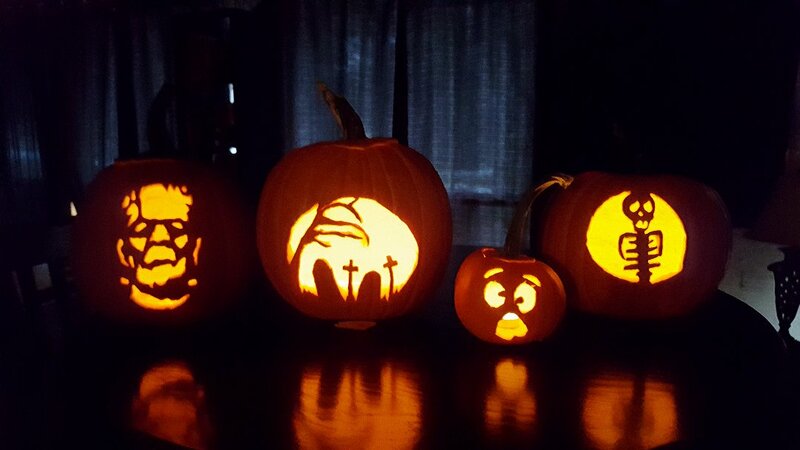 The fifth pumpkin was for my Grim Hollow scarecrow. I just noticed the snow on the ground...Eeek...too soon...I don't remember it snowing last year on Halloween...I probably repressed that memory lol! 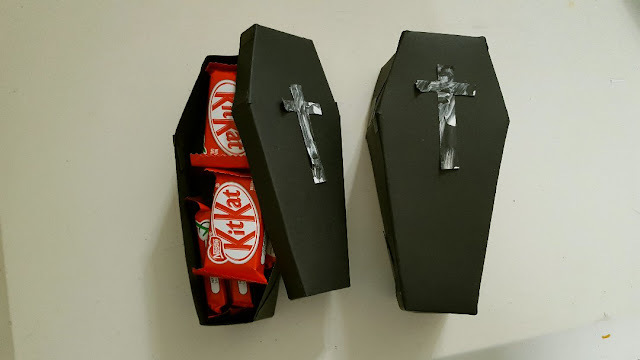 I made little coffins for treats for me and Alex. And shrunken heads made of apples. 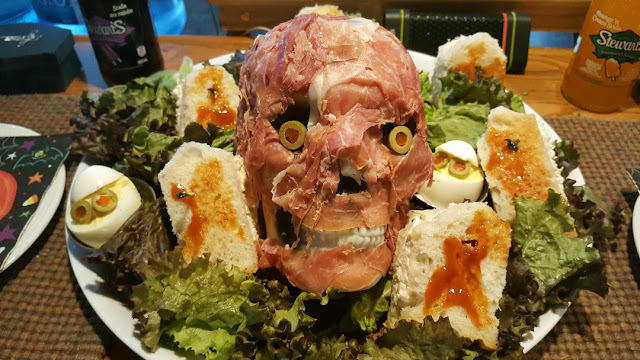 Lunch was a prosciutto head with coffin-shaped sandwiches and little egg men...actually it looked nice and creepy but Alex and I couldn't stomach the prosciutto lol...I went overboard on the yikes-factor lol! Here's a close-up, pretty grosse huh? Dinner was easier to stomach! 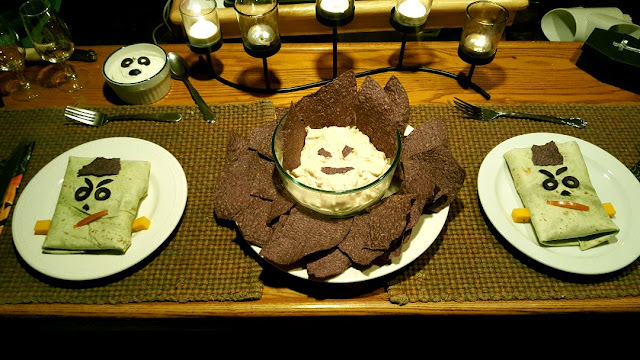 I made "Boo-ritos" with cheese and chicken...and a cheese dip. 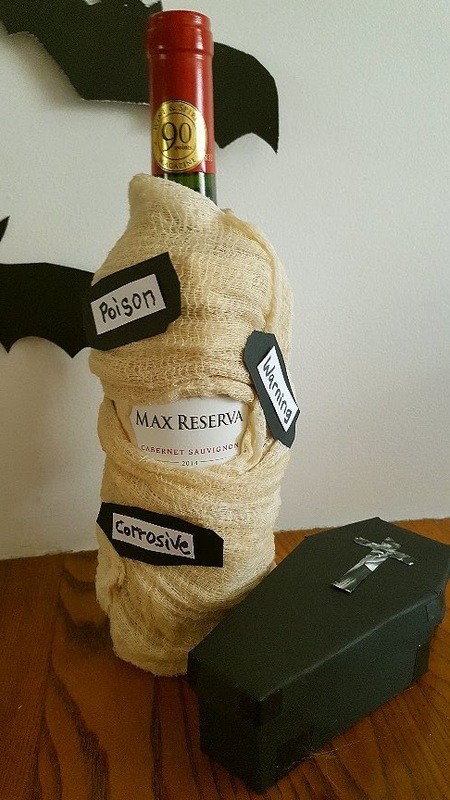 I even decorated our wine bottle! 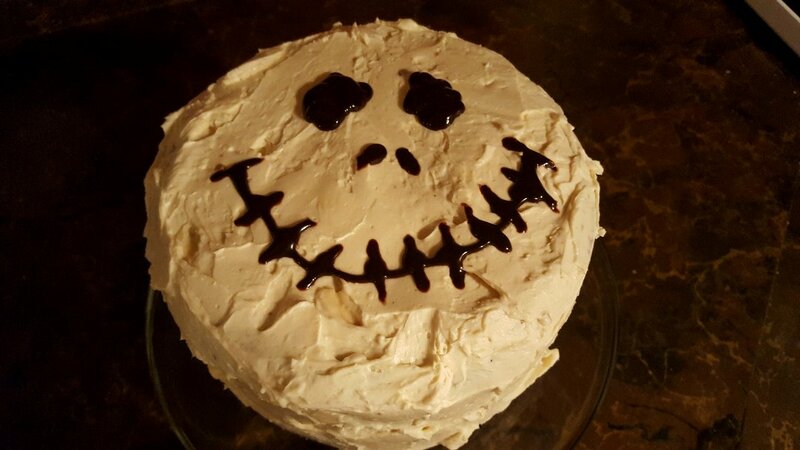 Dessert was a double layer Jack Skellington cake. We had too much cake! 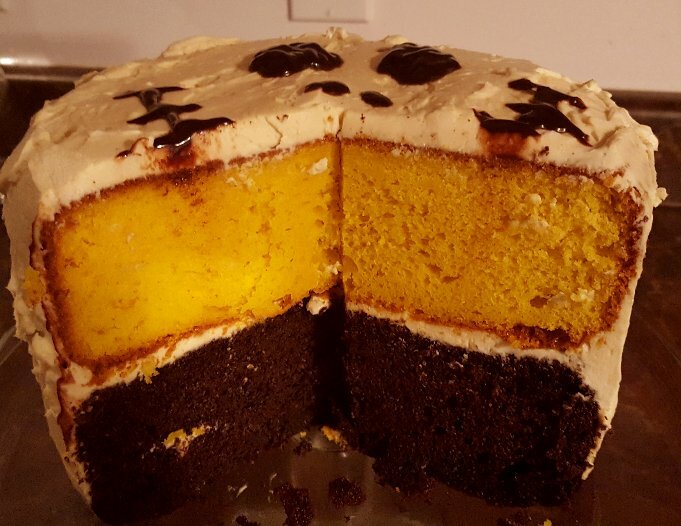 The top layer was coloured with carrot juice since we can't handle food colouring. I think we went through THREE of these last year, oh my....can I get away with saying we were fattening up for the winter lol??? I have so many good ideas for this year, but I don't know how I'll outdo last year's efforts! I still have Canadian Thanksgiving next month so I'm going to try to focus on that first! Do you decorate for holidays and make special dinners? I'd love to see pictures from my friends! What brilliant ideas indeed, although I don't participate in the holiday but I do admire the effort people put into celebrating. Warm greetings to you. hey maybe you can make my baked brain!!!? it consists of melting cheese so there you go! just type it in my search bar to find out how to make it. it's wicked good too! i used to decorate soooo much for halloween and had huge parties when my kids were young. now i just decorate for fall. give me a grandkid or two and look out....i'll be back full speed ahead! you are beyond crafty your last year's Halloween season looks fabulous, very impressive! Your talent blows me away, Rain. You could be a very successful party planner with so much business you'd have to have a staff of 50. But, wait, that would involve dealing with people and you don't want to do that. (Me, neither!!) Your creative talents are simply off the charts. Glad you took those pictures from last year so we all could see them. 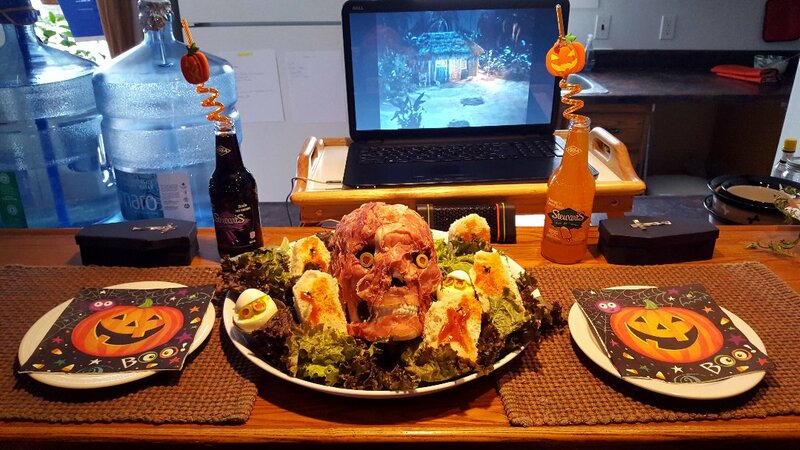 Wow........you certainly did a fantastic job to celebrate Halloween. Cant wait to see this years creations. Rain, sorry I haven't been by earlier. We lost power Monday night and didn't get it back until yesterday (or the day before, I can't remember). Getting back to normal now. When we had kids at home, Halloween was a favorite holiday for us too. Now a days, we like Christmas best, since the kids come home and visit us then. Glad all is well up there in far away Canada! Thanks Blogoratti :) I really enjoy how the holidays bring out that creativity and playfulness. If I had the time and energy, I'd do a lot more. Hi Joyce :) I left a comment on your blog, but that baked brain is something else lol...I love it! Melted cheese is always a hit lol..but it looks SO GROSSE I don't think we could eat it! I love to decorate for Halloween and do fun stuff. Alex and I don't have a social life at all, so we enjoy making our days special for the two of us! Thanks Christine! I have some great ideas for this year too! Ha ha Nancy! :) It was a lot of work, but a lot of fun to do. We're going out this week so I want to get some things to make my porch a little more fall-ish. Hi Mama Pea :)) Ha! You know me very well, I wouldn't be very good at any job with people involved lol...but thanks so much for the compliment! :) I'm trying to inspire myself to come up with new ideas. Every time I see blog posts about decorating, I really get into the mood! What a great post!! We go all out for decorating, inside and out. 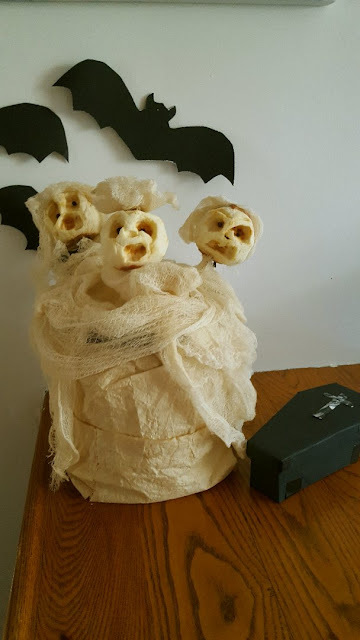 I have a confession, most of my decorations for inside are up all year round :) I asked my husband on August 1st if it was too early to bring out the coffin. My brother and I made an actual 5 foot toe pincher coffin last year to add to my props. I have life size headstones, I have a "girl" that comes out each year on October 1st and waits in the window (she's waiting for Halloween). You should see people's faces when they do a double take looking at our house. Hilarious! The list goes on and on.....I go crazy! The neighborhood kids love it too! Its almost here!!!!!! I am so stoked! 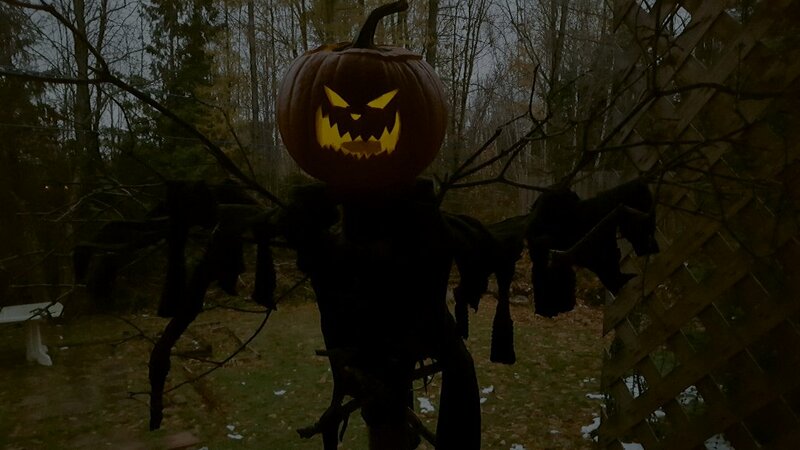 I love Halloween but I will wait till the first of Oct to put my stuff out...but I did put the fall stuff out and my Halloween pumpkins are facing the wall so I don't see the faces....YET! haha.